Arjay Books Quidquid latine dictum sit, altum videtur. Arjay Books is also home to Rick Sutcliffe's textbooks on ethical and social issues and on Modula-2. See the links on the fiction or non fiction menus for specific books. NOTE: If this site does not work correctly it may be because your browser is too old and needs updating. Let us know otherwise. Arjay Books has information on Christian Fiction, Christian SF in particular, Irish Celtic fiction, and Canadian Fiction. Note that though the award winning Christian SF available via Arjay Books does contain some battle scenes and depictions of sin, these are neither dwelled upon nor graphically described. There is no so-called "adult" material here. Each novel depicts characters making ethical choices in their use of technology and also contains one or more explicit presentations of the Gospel. Warning: readers may therefore be provoked to think as well as be entertained. Arjay Books also offers gateways and resources for writing, eBooks, Christianity, Irish/Celtic culture, ethics, and Modula-2. A separate Arjay site, The Northern Spy has a computing column and Mac portal. Another, opundo has philology and clean humour. Yet another, Sheaves Christian Resources has links to Christian sites, the column Sheavings, and other resources. The news feed at right and other Arjay news is available here. In a sufficiently hi-tech society numerous individuals are capable of mass destruction via nuclear or biological weapons. To survive, civilization requires a pervasive moral code limiting the use of technology, but in a fallen world this needs policing, and so do the police. The Interregnum is the sixty-year tale of James IV most Christian High King of a very different Ireland, who is deposed in 1941 by a cabal of his nobles. Exiled to Irish North America, he and his cousins find unlikely romance, and promote traditional honour in their sixty-year quest attempt to thwart the genocidal schemes of Tara's enemies and regain the throne of Ireland. Sergeant Brian McIlhargey carries on the fight in a later generation. Who arranged the King's deposition and exile? Which cousin has he become? Who are Brian's mysterious young wards? What really happened at the battle of Glenmorgan? Why does a mere Sergeant possess two of the three royal swords? Can one family stand against the corrupt rulers of two worlds? What if one of its own members goes bad? The Throne is the thousand tale of Ireland's monarchy, from its establishment under Brian Boru after he survives the battle of Clontarf in 1014 through to the scheduled end of the Interregnum in 2001, the subsequent second Battle of Glenmorgan, and its aftermath. These stories are told around the lives of Pelik and Samadaya, the unrepentant and repentant (respectively) versions of Cain, whom to kill attracts a curse, and whose death produces only a temporary reset, until what remains is reorganized and the dead man starts anew with a younger body, and a temporary loss of memories. But when those memories return, the conflict between the two adversaries, one a friend of God, the other his enemy, renews once again, usually around who will occupy Ireland's throne. After all, from the mid fifteenth century, she is the world's only superpower. Sutcliffe's Christian SF books may appeal to fans of C.S. Lewis and J.R.R. Tolkien. It spotlights Christian ideas in a high-tech society very different from ours. 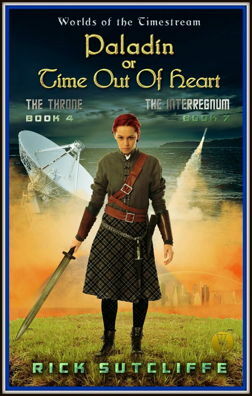 This is soft science fiction, sword but not sorcery, good clean reading, and an exciting, fast-paced page turner--suitable for both teenagers and adults. If you want to review books in The Interregnum or in The Throne, contact us. The website information on The Timestream has been expanded, reorganized, and updated. An article on the weights and measures of Ortho Earth (Hibernia) is available and so is a travel guide to the central part of Tara. For those who become confused in following the story line of books in The Interregnum or The Throne there is also a genealogy of the recent Hibernian royals and a glossary of terms used in The Interregnum available. These two files are now included in each of the books. There is also now a historical timeline of some major events in Hibernian history (the alternate history of planet Ortho) located here and an explanation of Hibernian heraldry here to assist in following the books.